Tomorrow is All Hallows' Eve and you may be tempted to put on a sport-themed costume in an effort to win candy and prizes. You should seriously rethink that strategy. 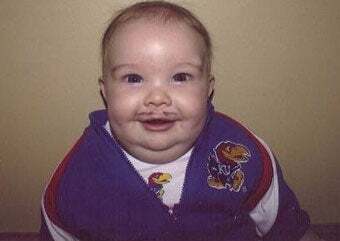 Sorry, but there can only be one Baby Mangino. There are two keys to any great Halloween costume—originality and recognition factor. It's a very delicate and tricky balance, especially when it comes to something large swaths of the population don't give a crap about, like famous athletes. So consider your potential audience. You could go with something that everyone will get—like say, Brett Favre—but risk being the 16th person to show up at the party wearing a No. 4 jersey. Real clever. Or you could go obscure—like say, Howie Schwab—and risk having people think you're a confused Hartford Whalers fan who just wandered into the wrong bar. Even Howie himself would be stumped by that costume. So how do you find the perfect outfit that will blow everyone way simply because no one else ever thought they could pull it off? Don't ask me. For the 29th year in a row, I will be going as Tweety-Bird. It won me the $3 first-prize at the Fire Department Cake Walk/Children's Halloween Parade in 1980 and I will continue to dance with the one the brung me. However, I would like to offer a couple suggestions. Bad Costume Idea: "Naked Erin Andrews." Seriously, New York Post. That's just ... wow. Best Costume Idea: Zola Budd. Get a South African running singlet, a bad 80's wig and then walk around tripping people all night. Just try to avoid any parties with guests under 30 years old. Bad Costume Idea: "George Brett Crapping His Pants." I'm sorry, did you not want to get laid on the sluttiest holiday of the year? (Much) Better Costume Idea: "Adrian Peterson, In Nike Battle Armor." Degree of difficulty extremely high, but if you can simulate the hexagonal scaly skin thing—without devolving into an offensive blackface minstrel show—you will not only creep everyone out, you will have your finger on the pulse of American advertising. Excellent product placement opportunities. Best Costume Idea: "Alex Rodriguez's Mirror." Invite ladies to stare longingly at your purple lips and bulging pectorals. Little do they know, your costume is actually a secret kissing booth. Do You Think Alex Rodriguez Regrets This Details Photo Shoot Now?